Monday, I came home early from our three-day multi-family camping trip (briefly: heat, beach, heat, food, and heat at the Upper Canada Migratory Bird Sanctuary) to coach our minor baseball A’s in the extra innings of a tie game called on account of darkness Thursday. The other team could not field enough players and had to forfeit, putting us in the final losers’ bracket game against a team that beat us 8-5 previously. We had a bit of infield practice instead of our game in anticipation of yesterday’s losers’ final. Wow, did it pay off. Our team played the best defensive game of baseball I’ve seen and that includes the B-level tournament select members participated in a few weeks ago. Our pitchers threw strikes. Our two pitchers got through the six innings in 80 pitches. Our shortstop, who had never played baseball before mid-summer, played a flawless game. Our third baseman likewise. Our outfielders got the ball back to the infield quickly. I don’t want to dwell on errors, but on defense we made only two: a misguided throw home instead of to the cutoff man that allowed a runner to advance to third and a ground ball that our second baseman should have grabbed. Every other ball in play was either a solid hit or, more often, turned into an out. It was a spectacular game to watch. We need to work on our hitting, though. We won only 2-1. Part of that was poor baserunning. We handed over three crucial outs on the basepaths. One was our first batter of the game, who walked and took a step off first base to be tagged by the first baseman. I’ve seen better sportsmanship, but not better gamesmanship. Another out was a foolish attempt to steal third on the runner’s own initiative, and another was a baserunner who took off for third, stopped, and returned to second as the runner from first slid in to that base. Those outs may have cost us runs; regardless, we still need better hitting. We play in the championship Saturday and we’ll need to win twice to be champions. We can do it. If you want to see photos of our boys, go to this page and scroll through. That’s Child Three with the wide stance at the plate. Here he is catching. In this one, you can see me with mono coaching third base and scoring. Followers of 101 know what I think newspapers have to do to succeed, never mind survive. It boils down to one word: local. Newswire filler, sports scores, general interest – all that is available on the Web earlier, in larger amounts, and often plain old better. Newspapers need to focus on the local issues. They need to use the paid resources – researchers and reporters – to dig and do some work instead of producing pap like syndicated veterinary advice or – in Montreal’s case – baseball. Bill Wyman, in “Five Key Reasons Why Newspapers Are Failing” on Splicetoday, has a far more detailed look at the thesis. Read it all, but I want to point out two of his nine conclusions, the first because it agrees with me and the second (his sixth) because one of my former students is sort of doing that in a blog. Fiona O’Connor’s work on her Montreal for Insiders blog isn’t detailed enough to please Wyman, and the layout could use some tweaks, but it’s a good start. I’m not sure if one person could do all that work as a sideline endeavour. I seem to be over my latest bout with exhaustion. Elvi and Child One volunteered to help with the recently concluded World Science Fiction Convention that passed through Montreal. Don’t let the generic name fool you; this is the big one, where deserving recipients receive their Hugo Awards. The guest of honour this year was Neil Gaiman, a favourite author of all three ladies in my house and millions more across the world. Elvi thought that volunteering would get her a taste of the con, tickets to which cost $250 and I think those are American dollars. It did, but a friend of hers had to cancel and sold her a ticket for $100. Awesome! She asked People In Charge if Child One’s service could count toward a reduced rate but unfortunately it couldn’t. Wires crossed at just the right time, however, because a person in northern California had just anonymously donated her ticket to be used by a student in need. Child One gratefully accepted it. By gratefully, I mean she even wrote a gracious thank-you note to the anonymous benefactor. Child Two took advantage of the $60 conference rate for kids so in the end, my family spent $160 for $560 worth of registration and – not to sound too much like a MasterCard commercial – priceless memories that will last a lifetime. I’ve been trying to pin the ladies down so I could detail their fantasies come true (hey, I like that pun) but in the end I decided they could write about it themselves – I’ll post the pictures, though. 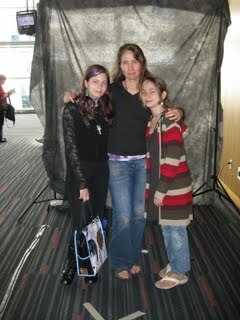 I will say that by the end of the convention, Neil Gaiman recognized my girls by face and name. Child Two was in the front row of every one of his talks/events. At a kids’ workshop she constructed a fabric image that Gaiman pronounced “a brilliant version of Coraline” (at left, in progress). Child Two’s stardom took another little step forward during a panel discussion of Studio Ghibli anime features. Her insightful comments led the moderator to invite her up to join the panelists after one had to leave early. Yes, my 12-year-old daughter was a panelist at the largest science-fiction show on Earth. That would have been enough for a memorable few days, but it doesn’t stop there. Kyle Cassidy, a photographer friend of Gaiman’s, lugged his equipment to Montreal to photograph Gaiman fans. Yes, he took photos of my ladies. I don’t want to post his photo here, for copyright reasons and because you really ought to go to his site and read the flattering comments. I will post a photo of them that Cassidy took with our camera so you can compare the difference a few thousand dollars’ worth of equipment makes. It’s good advice. Her dad needs to follow it. I’ve been too busy to blog lately and I apologize for the weeks without entries. I’m starting even this one with a plan for a short entry. My mono is essentially gone, although Monday I appear to have suffered a relapse. I worked in the morning but come 2:00 p.m. I couldn’t think anymore. I lay down at 3:00 p.m., fell asleep before 5:00 p.m., and slept until 8:00 p.m. I spent some time with the family and went to bed at midnight. I awoke at 11:00 a.m. That’s a lot of sleep. Even though I had a busy weekend, it’s not normal. The fatigue continued yesterday and is still with me. I should break out of it soon. My weekend was busy because Child Three represented NDG in a baseball tournament at the Participation level. We had two games Friday, a game Saturday afternoon and two games Sunday. Squeezed in there were two hockey games and all of this happened in Brossard. Yes, the hockey took place at the Canadiens’ new practice facility, which as you might expect is well-kept. Pictures of current Montreal Canadiens line the hall along which the dressing rooms branch off, and it’s a bit sad to see so many blank spots, particularly for Saku Koivu and Alex Kovalev. I haven’t spoken much about the Canadiens’ moves and there’s nothing original to say now, but let me add a melancholy “me, too” to those who say this city will miss Saku Koivu the man more than the team will miss the hockey player. This week, Child Three is in goalie camp at McGill. I could end there, but let me throw some baseball in. My Irrational League team continues to hold first place, but my lead has shrunk with the extended absence of Carlos Beltran. The team is close to the bottom in home runs, but elsewhere continues to excel. My gambit of drafting Matt Holliday at the start of the year has paid off handsomely and in Monday’s add/drop I was pleased to see Mat Latos somehow skip past all nine other teams and land on my roster. My overall lead is 7.5 points.